I could not wait to get my bleached-blonde hair to silver. It took about three years and several salon visits, working to get the yellow out. It seemed at times it would never happen. And then with my latest hair trim, boom, I was there. Salt and pepper, with mostly salt. Cool. And now I am wondering if it’s aging my overall look. I know, I know, silver is fabulous (it is) and “looking one’s age” is not a crime, not even a misdemeanor. But, due to my contrary nature, I’m now looking for ways to experiment with my silver hair. Linda Fargo, Style Director at Bergdorf Goodman, has sleek, polished silver hair. Love this style, but my hair won’t cooperate without a can of hairspray. A whole can. From this Pinterest board. My hair looks slightly blonde here, but that’s the sunlight. So experimenting with some play-color is one option. I’ve applied Manic Panic pink tips, and I like the results. I’m considering going pale rose-gold all over, using the temporary color. It washes out in one or two warm shampoos, so there’s no danger of getting stuck with unintended consequences. I’ve also found that wearing a little more makeup, especially cheek and eye color, helps alleviate the I’m-all-one-color look. My gorgeous friend Alida of My Makeover Mission coached me on wearing a darker eyeshadow, more blush, and deeper lipstick for contrast. And a few days later, another gorgeous friend, Suzanne of Suzanne Carillo Style, actually sent me a Wet and Wild lipstick in “Wine Room”. With some pink tips on my hair and added blush, and Suzanne’s lipstick, sent all the way from Canada. You know I’m a big proponent of playing with hair colour! I love the pink tips, and YES to the brighter lippy! How thoughtful of Suzanne! My current plan is overall lightening to my natural white/grey, but keeping in the lavender family. It’s a change, and I love it. Embrace it! Love the silver – and the CURLS. Both very becoming on you. The curls remind me of my daughter’s hair, and she’s always complaining about those curls. Some of us would kill to have hair like that. Youre so chic in new hair color! The silver is really suitable for you! The pink tips and the addition of a bright lipstick adds lovely colour to your face and breaks up the “all one colour” look. 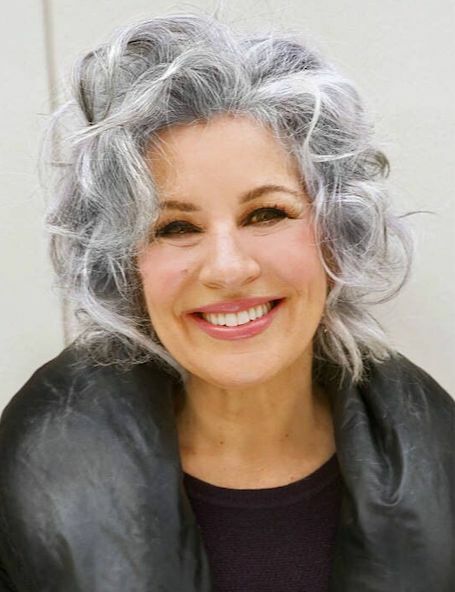 I enjoy seeing women with grey hair playing with fun colours in the form of tips, streaks, or a big swath of bold colour. As a fellow naturally pale person, I have found that I need to add colour to my face now that my hair is mostly grey. I would like it to be all grey rather than the patchy “salt and pepper” thing that is going on now, but I don’t know what tone of grey it’s going to be. Linda Fargo’s colour is lovely, isn’t it? 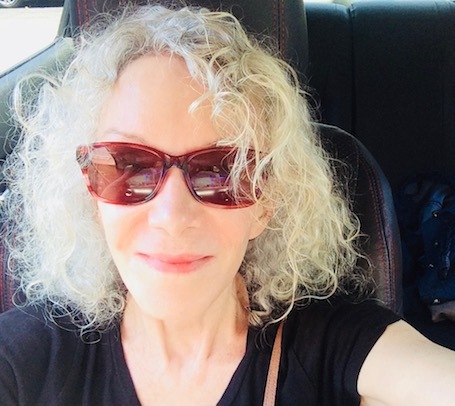 Love your silver curls Patti… and the gorgeous sleek cut of the first image you shared. Silver hair is SO cool just now! I do love a grey hairstyle (those ladies in the pictures look fab! ), and I think that your own style looks cool, love that lipstick!, you’re gorgeous! I have followed your silver journey and its suits you perfectly and agree that the extra blush , darker eyes and lippy takes it up a notch. Linda Fargo’s hair is my aim , same dead straight hair just not the colour, am still tossing up whether to stop colouring and just be patient until the silver may happen. I love the silver on you! It does not make you look older. I have fine hair, too, and I think my hair is stronger and healthier without dye. No heat, either, but I don’t think you do that with your lovely curls. I’m 62 and when I tried to get my senior discount on the golf course today, the guy said, no way. It’s all in your attitude and how you present yourself. You’ve got this. I think your hair looks like a fluffy, soft halo of silver. When you are very light skinned with light eyes sometimes it can make you look pale all over with light hair. I do agree that the added lipstick makes a big difference. You are looking very coquettish in that last photo! Now that I’ve been red for quite a few years I find that my natural blonde makes me feel very washed out. I will have a hard time going back to it. The darker red makes my eyes pop and is so much friendlier for my skin tone. Agreed, that dark red hair is really your color – vibrant and a stand-out in the crowd. Thanks for the nice words too, xox. You can carry the silver. I say go with it. I don’t think it ages you. I think a woman shows her age more in her stance/posture and movement than in her coloring. So go with it. You can change your mind again later. BTW, unrelated, Speedo was selling a long sleeved swimsuit for paddle boarding in Costco this year. Might be worth checking out. Obnoxiously comfortable. (I swim laps but have to keep my forearms out of the sun.) The sleeves are nicely long. The sleeves are close around my arms but I move the wrinkles above my elbows before I zip up and the fit is BEAUTIFUL. Stretchy, not baggy. Close and supportive but not skin tight. No sausage. You look amazing — that lipstick is an inspired choice. 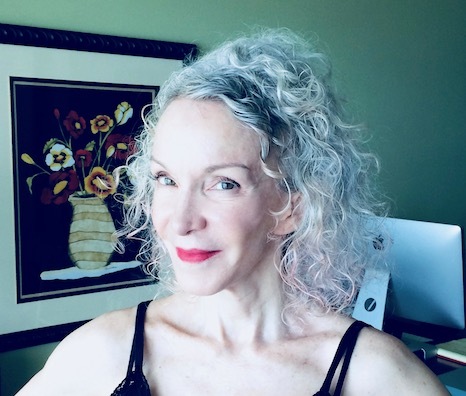 I am 68 and still waiting for my hair to go grey all over. It’s still grey in patches. Sigh. Thanks for the kind words Sherry. I’m loving your new silver-y shade as well, xox. Your hair looks great and the make-up really suits you. Most of my silver is in the back of my head :o( The front retains mostly dark brown- so frustrating! LOL! Blush is my best friend sometimes. I love the idea of playing around with your color—never stop! Do be careful tho–light colors really do absorb color super easy, even temp ones. Clairol Shimmer lights shampoo once a week to keep the silver sparkle! I love the silver and the wild curls! If you were interested in more defined curls, you should try the online MAP method course by Scott Musgrave. If you take the course you get access to the facebook group where the nicest people on the internet can help you troubleshoot your hair. If you look at #mapmethod on Instagram you can see some of the people in the class and their progress. I second that advice. It is worth the cost. If you like lavender color, Fabola Shampoo will give that color and it will last a few regular shampoos. My stylist recommended that shampoo and it’s great! I think upping your colour in your makeup helps give the colour you need, I like the look. At the moment I am low lighting my hair, but eventually will let it go grey. I’m stopping the color on my hair and let my grays surface. I feel like it will take so long. It’s darker underneath but blonde on top and about 3 inches of gray in the roots. I’m using purple shampoo to cut back on the brass. I keep debating if I should just go get a short cut to speed the process. I’m tired of the never-ending cycle of color. I discovered that it was too dark and took about 2 weeks to get where I was happy with the color, but them BAM, the roots would show and it was just a matter of weeks before I wasn’t happy with the look again. I’m getting off that merry-go-round. I hope I look as fabulous with my hair as you do with yours. Remember to never use hair products that are red, yellow, or orange. Only clear or cool colors — even a tiny bit of yellow pigment can build up on your silver hair and turn it yellow. And I can highly recommend Palmer’s Olive Oil Formula Gro Therapy for taming/enhancing frizzy curls. You’ll find it in the Black Hair section of many stores. It’s a good skin treatment in general.